Action learning or Experiential Learning is the process of learning concepts, skills and ideas through being engaged within an activity. Experiential education is a philosophy that informs many methodologies in which educators purposefully engage with learners in direct experience and focused reflection in order to increase knowledge, develop skills, clarify values, and develop people's capacity to contribute to their communities, departments or organization. We have found that the most effective type of experiential learning is connected with the arts, like with music and rhythm or the very best we have observed is using a skillfully designed team building with culinary arts. All of the arts cross over cultural, generational and gender barriers and allows the participants to be totally engaged and present. Culinary arts is the most superior of all of the team building forms through art because it relies on something that we do everyday, EAT! You don't have to explain eating to a group, so instant rapport with the activity, the facilitator and the process happens. Also, many more of our senses are effected and engaged with cooking and eating: visual (design of the food served), auditory (the sound of the food and comments), kinesthetic (tactile handling of the food, feeling of satisfaction), olfactory (the smell of the food) and of course gustatory, the taste of food. The more senses that can be connected or anchored into the experiential education, the deeper the impact and retention for the group to retain and apply back at the workplace. 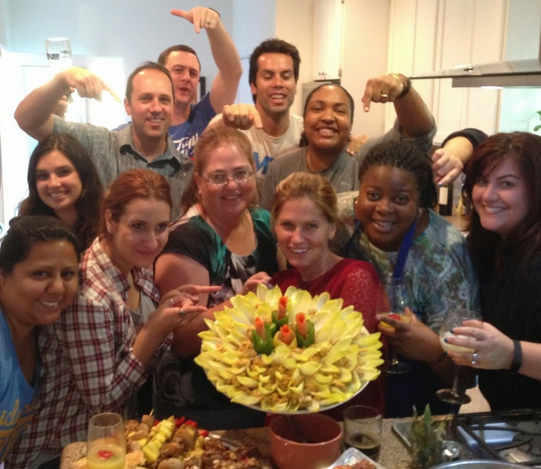 Our sister company, CEO Chef, focuses on team development through food and cooking team buildings. What makes these culinary team building exercises so appealing is that they can be done anywhere, especially on your business campus or at our host hotel where we conduct our leadership and strategic retreats for your group. Create a delicious gourmet meal with no recipes, no kitchen, and no training by signing up for CEO Chef's most popular flagship team building exercise! Impossible as it may seem, it's true that you can enjoy a unique bonding experience with the people you see every day through cooking and eating together.